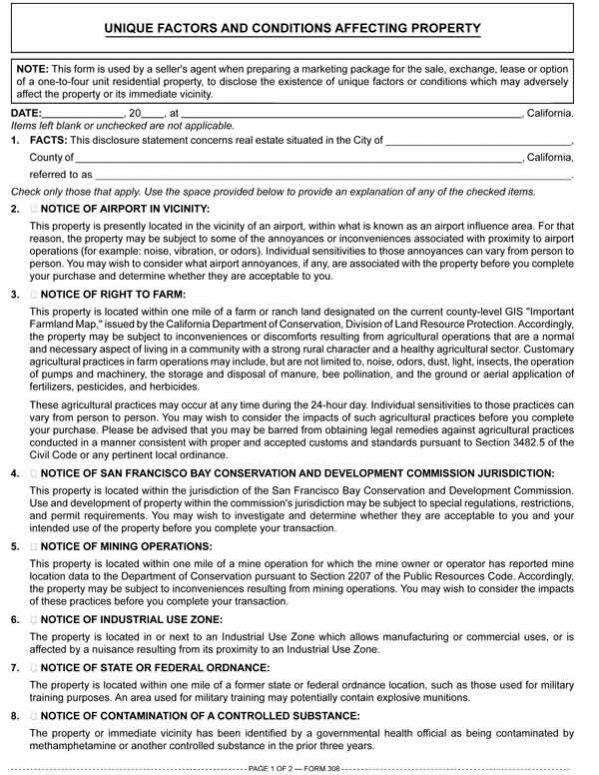 This form is used by a seller’s agent when preparing a marketing package for the sale, exchange, lease or option of a one-to-four unit residential property, to disclose the existence of unique factors or conditions which may adversely affect the property or its immediate vicinity. The property is located in or next to an Industrial Use Zone which allows manufacturing or commercial uses, or is affected by a nuisance resulting from its proximity to an Industrial Use Zone. The property is located within one mile of a former state or federal ordnance location, such as those used for military training purposes. An area used for military training may potentially contain explosive munitions. The property or immediate vicinity has been identified by a governmental health official as being contaminated by methamphetamine or another controlled substance in the prior three years. 8.1  If the property was the site of a former meth lab, the property has been cleaned of hazardous materials by an authorized and certified contractor and the property is suitable for habitation. A death has occurred on the property within the prior three years. An insurance claim affecting the property has been filed within the previous five years. A prior insurance claim may increase the cost of insuring the property for subsequent owners. Form updated 08-2016 to include the Form Description at the top, white header/footer convention and RPI branding.